Our useful range of postal mailing boxes includes various sizes of both strong self-seal cardboard postage boxes and foam lined boxes, all designed to keep a wide range of objects safe and secure while in transit. The cardboard mailing boxes are flat-packed and assembled in one move to form rigid cartons that don’t need tape or glue for sealing. 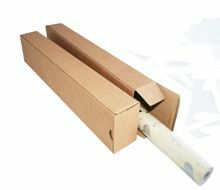 The foam lined shipping boxes are made specially to post delicate items safely, with a padded inner sleeve slotting into the robust outer cardboard carton. Strong, economical and providing excellent protection, our postal boxes are the ideal postal solution. 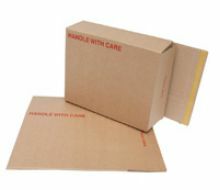 These boxes for mailing come in different sizes so can cater to many postal needs or requirements. They are quick and easy to use, saving you time and increasing your production. Posting your items, whether they are fragile or otherwise, is made easier and more convenient with our postal boxes. Strong and secure, our cardboard mailing boxes are all designed to ensure the contents arrive in their original condition. 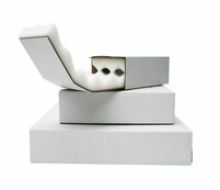 Choose from the ranges of foam lined boxes or flat packed postal cartons. 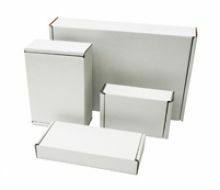 Our smart foam lined shipping boxes are ideal for posting delicate items and provide double-layer protection with the exterior white cardboard cartons enclosing a foam laminated interior. They are available in three sizes. 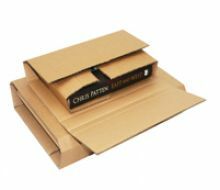 The flat packed cardboard postage boxes are also available in three sizes. They are tough and durable, easy to store and use. They have the bonus of a high-tack self-seal feature which means you don’t need adhesive tape or glue. 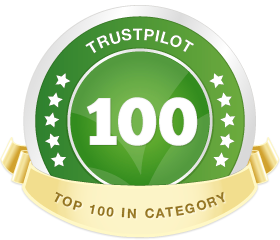 Our postal mailing boxes provide a highly presentable and secure means of packaging.